This resectoscope includes 4 main pieces that must be assembled to become functional. 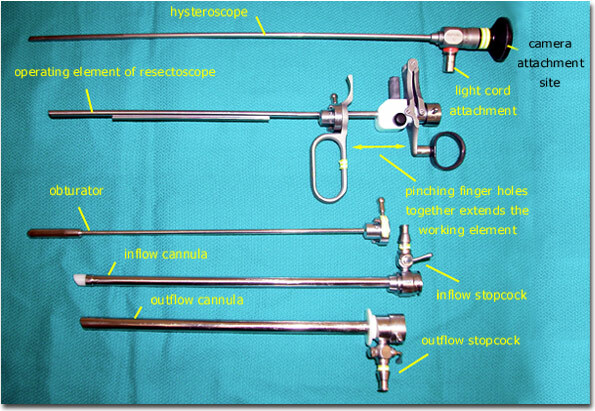 The hysteroscope is passed through the operating element of the resectoscope, locked into place, and a working element (loop electrode, roller ball, etc) is then secured in place within the operating element. The hysteroscope in this photo appears slightly curved but in fact it is perfectly straight. The apparent curve is a photographic artifact. A camera can be placed onto the black (viewing) end of the hysteroscope. A light cord is also attached to the hysteroscope. The working element that is secured to the operating element extends outward when the finger holes of the operating element are pinched together. The inflow cannula is placed through the outflow cannula and locked into place. The obturator is placed into the inflow cannula to prevent potential blockage by cervical or endometrial tissue during insertion. The inflow cannula is connected to the distention media at the stopcock via tubing. The outflow cannula is generally connected to a suction device at the stopcock via tubing.